Angel High-Conversion Efficiency Gluco-Amylase is derived through extraction and refinement from the Aspergillus niger, with high enzyme activity and glucose conversion. The product is widely used to produce glucose to saccharify liquefied starch from various sources including corn, wheat, barley, rice, tapioca, potato etc. This product can be used in production of alcohol, starch sugar, monosodium glutamate, antibiotics, citric acid, beer, Chinese rice wine, and other fermentation products. 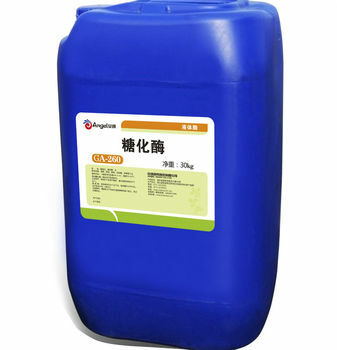 The recommended for optimum industry operation condition is temperature 58~62°C, pH4.0-4.5; commonly adjust pH first, and then add into Gluco-Amylase. The usage of the enzyme comes with the industry, material, technics. The supplier is ranked number 4 by reviews data in Food Ingredients. The supplier is ranked number 4 by responses data in Food Ingredients. The supplier is ranked number 5 by delivery data in Food Ingredients.